Ellington Field, currently known as Ellington International Airport has been in existence as a military airfield since 1917. Starting life as an Army training airfield, Ellington is today used by a number of Government departments together with the commercial and general aviation sectors. 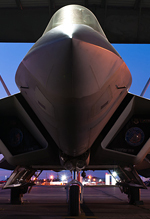 Now owned by the City of Houston, the tenant Government units include all the military branches operating everything including MQ-1A Predators. 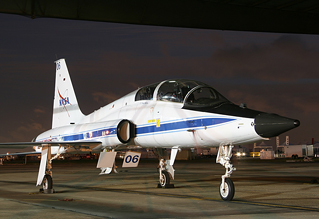 In addition, Ellington hosts a large contingent of US Coastguard aircraft and a NASA Facility operating T-38 Talons. 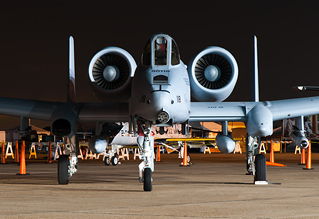 On the civilian side of things, residents of note include the Commemorative Air Force and the Texas Flying Legends Museum; both of which operate a range of rare airworthy warbirds from the airfield. Report by Andy Evans with additional photography from Paul Newbold and Chris Barkby. 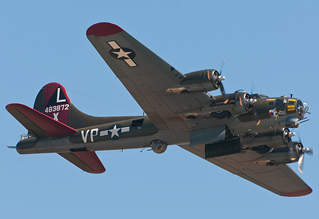 Wings Over Houston is one of the main shows that the Commemorative Air Force organises around the United States each year, with this event being organised jointly between the Houston and Gold Coast wings. Otherwise known as the CAF, this fraternity of veterans and enthusiasts was formed in 1957 when a group of veteran pilots together bought a P-51 Mustang. This was joined by a pair of F8F Bearcats shortly afterwards and a legend was born. The CAF credit themselves with starting the worldwide warbird movement and today operate a fleet of over 150 warbirds, ranging from P-51 Mustangs to the B-29 'Fifi', covering 60 different types. What makes the CAF unique is that it allocates military ranks to its members with full senior members achieving the rank of Colonel. Taking this on to another level, the fleet are distributed through 27 States as 73 separate Units, just like a true Air Force. This all from a non profit organisation whose 9000 members main mission is to keep history alive by honouring the past whilst educating new generations. Held over the weekend of October 27-28th 2012 this was the 28th Wings Over Houston airshow held and whilst the main attraction is the aircraft there were also plenty of other things to see and do for the 100,000+ crowd over the weekend. 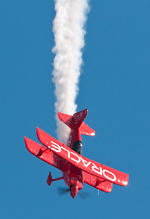 This ranged from the regular attractions at United States airshows in the form of jet cars and ground displays to a special after show concert that took place after the first day of the show. One of the more unique aspects of the Wings Over Houston airshow is a special limited ticket available to the hardened enthusiast community granting access to the warbird static and flying dispersal just before dawn. This gives some photographic opportunities that are not usually available to the normal enthusiast making this a very sought after ticket every year. Due to the unique layout of the show, prior to the flying display commencing the general public are allowed access to the massive gathering of warbird aircraft assembled to take part in the flying display. This allows for a very special interaction to take place between the public and the crews of these aircraft; for the photographer, this allows for some unusual angles to be obtained on subjects that at European events would be impossible. In addition, as is the case with many other US shows the main star of the display, in this case the US Navy Blue Angels, are parked in front of the crowd so that they can see everything that goes on in preparing the aircraft and the ground show involved. With such a wide variety of operators using Ellington field, the formal static display contained some unusual and rare beasts. These were both large and small. Three of the largest aircraft, as expected, belonged to the USAF in the form of a B-52H, C-5A and C-17A. The fourth large aircraft in attendance holds a special place in the heart of many enthusiasts, NASA's heavily modified 747 Shuttle Carrier Aircraft. All the branches of the US Military were represented with one of the highlights being the very rare E-9 Widget which is used to ensure that the ranges in the Gulf of Mexico are clear of civilian boats and aircraft during live weapon tests, it's AN/APS-143(V)-1 radar has the capability to detect a person in a life raft from 25 miles away. Other highlights included the USMC MV-22B Osprey, adorned with special '007' markings and a collection of warbirds that were not taking part in the flying display, including the venerable B-17 Flying Fortress. The flying display at Wings Over Houston, as with many US shows, kicks off with the flags being parachuted into the airfield as the National Anthem is performed. 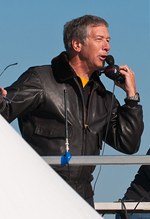 However this year under the watchful eye of famous airshow commentator, Rob Reider, and air boss, Ralph Ross, this was performed with a twist. Already airborne waiting for the parachutists were a pair of the worlds' foremost aerobatic performers, Sean D Tucker in his Oracle Challenger and David Martin with his Breitling sponsored CAP232. As the parachutists floated to earth, both pilots spiralled downwards around them creating a tunnel of smoke. As always at US airshows, there is complete silence from the crowd during the singing of the anthem only to be then shattered by thunderous applause upon its completion. No-one can say that the US public are not patriotic. Following this initial spectacle, the full flying display kicked off with displays from both Sean and David stunning the crowd with their aerobatics manoeuvres, including Sean's signature low level tape cutting antics. These were quickly followed by a display that is familiar to any enthusiast that attended the 2012 Royal International Air Tattoo or Farnborough International Airshow; namely the USMC demonstration of the MV-22B Osprey. This display was virtually identical to the display performed in the UK earlier in the year and consisted of a few passes in aircraft mode followed by a transition to helicopter mode and hover landing. Usually, these three airshow acts would not be described as the 'warm up' however due to the calibre of the display at Wings Over Houston it certainly felt that they were. 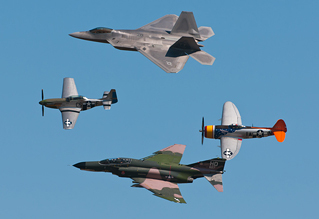 Following these acts, the rest of the flying display could be split into two halves; warbird and modern. As Wings Over Houston is organised by the CAF, it is hardly surprising that a major proportion of the flying display centred around warbirds. This was to such a level that it made Duxford's Flying Legends Airshow look small by comparison. In total, the warbird flying display involved 46 genuine piston powered warbirds covering 36 different variants from World War Two and all the way up to Vietnam. Many of the 'regular' warbirds such as the B-17 and P-51D were represented in this display however, there were also some more unusual and rarely seen (especially outside of the USA) types flying. Of note was the flying appearance of a Curtiss SB2C-5 Helldiver and its carrier borne brother, the Douglas SBD-5 Dauntless; these were pitted against one of the few flying A6M2 Zero fighters in the world. Not to be outdone in the rarity stakes, the USMC were represented by a PBJ-1J known as 'Devil Dog'. The PBJ-1J is a little known version of the B-25J Mitchell operated by the USMC in the Pacific theatre as low level raider bombers. 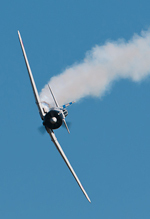 Separating the many genuine warbird displays was a set piece demonstration involving pyrotechnics which has gained notoriety the world over for its non-stop action. The Tora Tora Tora set piece recreates the eventful attack on Pearl Harbour by the Imperial Japanese Air Force in 1941 that brought the USA into World War Two. A large number of aircraft are involved in this display and to the casual viewer look like genuine Zero, Kate and Val aircraft however, this is an illusion. The Tora Tora Tora displays have been performed since 1972 using aircraft that had starred in the movie of the same name. As a result of the movie many people associate these aircraft shapes with the real aircraft that they represent. However, these aircraft are actually heavily modified common types such as Harvards/Texans cleverly disguised to look like Japanese warbirds. Regardless of this illusion, the action is nonstop with bombing and strafing runs coming in from all angles. This is made all the more real by the help of the 'Bomb Squad', a team of dedicated individuals that provide masses of pyrotechnics to last the full 20 to 30 minutes of the display whilst also providing a ground show dressed as troops trying to fight off the attack. 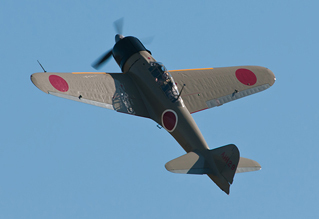 As the Tora Tora Tora team are associated with the CAF, the display at Houston had a small twist with other warbirds taking part to increase the historical accuracy. This was in the shape of the CAF's P-40K Warhawk playing the part of a small band of fighters trying to fight off the Japanese and their B-17G honouring the ill fated flight of B-17's that found themselves returning to base in the middle of the attack. As a tribute to those lost that day and as an educational tool, Tora Tora Tora is in the same league as the Battle of Britain Memorial Flight bringing knowledge and understanding to new generations that perhaps, have not had contact with a relative that experienced the Second World War first hand. 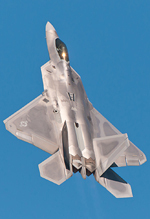 Following a literal banquet of warbird action, the display speeds right up to the modern day with the only solo fast jet demo from the USAF Air Combat Command taking the stage, the F-22A Raptor. As always, this display is wall to wall afterburner with a mixture of high speed passes and extreme turns making full use of its thrust vectoring. 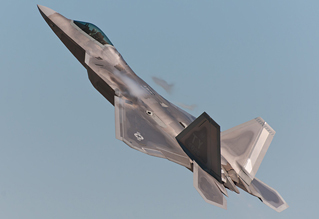 Over the past 12 months, the Raptor has not had a popular time in the media with a number of accidents attributed to oxygen supply problems to the pilot. This has over shadowed some major milestones such as the delivery of the final production aircraft and the first 'combat' deployment to the Middle East. It was therefore a very good PR exercise for the USAF to have it's premier fighter on display at the premier airshow in Texas. Since 1997, one of the most iconic features of US airshows has been the USAF Heritage Flight flown by the ACC demo teams in conjunction with a group of dedicated warbird pilots. Even with the reduction in the number of ACC demo teams in 2012, aircraft have still been made available for this display as a recognition of what it symbolises. At Wings Over Houston, the Raptor was joined by P-51D Mustang 'Galveston Gal' and P-47D Thunderbolt 'Tarheel Hal' in a number of formation passes before performing a break from crowd rear and entering the pattern to land. However, as can be seen from the photos, the heritage flight was joined by a fourth aircraft at Houston, representing the pilots that fought in the Vietnam war. The aircraft type in question? 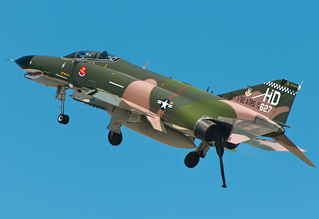 One that is very close to the air enthusiast heart and in the twilight of its operational life worldwide, the F-4 Phantom. In this instance, the example on display was a QF-4E aerial target from the 82nd ATRS (a unit that flew from Duxford from 1943 to 1945) based at Tyndall AFB, Florida. The aircraft used for the displays is kept in pristine condition and was given the opportunity to show off to the crowd before joining the Heritage Formation. Not only were the signature fast and heritage passes but a special slow dirty pass letting everything hang out, including the hook. The on looking crowd certainly appreciated the appearance of this venerable warrior with a standing ovation as the aircraft returned to its parking stand in front of the crowd, an appreciation that was returned by the pilots. The final display of the day was left to what for many was the main attraction at the 2012 airshow, the US Navy Blue Angels. The team has been in existence since 1946 and up to the end of 2011 had displayed to more than 484 million spectators. 2012 saw the 26th year that the Blue Angels have operated the F/A-18 Hornet and have recently upgraded from the original A model to the more modern C mode, now referred to as the Legacy Hornet to distinguish it from the E/F Super Hornet. As part of the magic of the Blue Angels, the procedure of pre-flight checks and crewing in the pilots is synchronised as a special ground show in front of the crowd. Whilst this ground show is performed, the USMC wing of the Blue Angels performed its display. 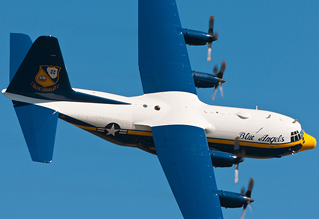 Known as Fat Albert Airlines, the USMC provide one of their C-130T Hercules as the team support aircraft. Not only does this provide support but it also performs displays itself at the beginning of the Blue Angels sequence, ending in a Khe Sanh approach onto the runway. Until recently this display included a rocket assisted take off using JATO bottles however, this is no longer performed. 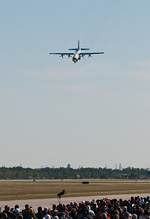 As soon as Fat Albert has cleared the runway, the Blues take to the air in two directions with the synchro pair performing some very energetic takeoffs. What follows is a display of extremely close precision flying and opposition moves, mixed in with performance turns and sneak passes from behind the crowd. What makes this different from any other fast jet display team around the world? 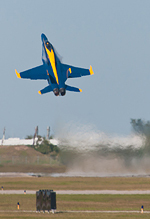 The Blue Angels pull high-g manoeuvres without wearing g-suit equipment! Putting the pilots in a league of their own. Wings Over Houston is one of the premier airshows in the United States and the 2012 event certainly lived up to the hype and reputation. The 2013 event has been announced for the weekend of 26th to 27th October and the organisation team have already announced that the event will include the USAF Thunderbirds and the US Navy F/A-18F Super Hornet display from VFA-122 at NAS Lemoore. As always, the event is sure to attract great interest from the enthusiast community and will not disappoint. 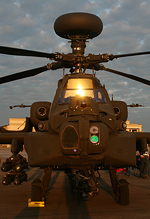 More information can be found at the Wings Over Houston official website. The authors would like to thank the Wings Over Houston organisation team for their welcome and access afforded for this article. A special mention is needed for Scott Timms for meeting the authors very early to allow before dawn access to the static and flight lines.